So there is a data model with 2 properties: first name and last name. I'm using custom converter to present this value "last name, first name" with logic behind it, that whenever one of the properties is null, converter returns null. 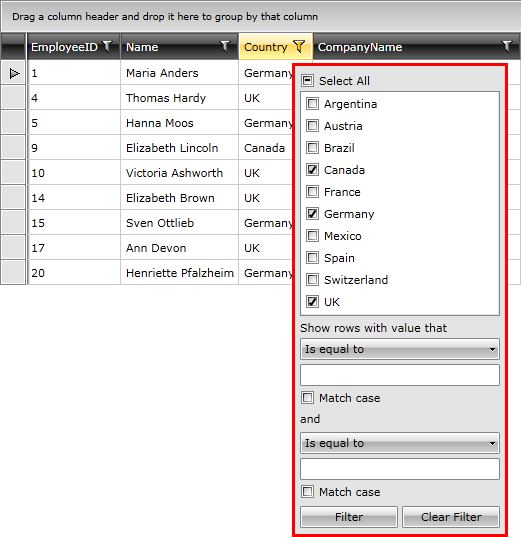 In this situation i also want a telerik filter on column but there is a problem bacause don't bind to converted value but to raw data. Is there any way to handle this, and have both converted string and filter that is bind to it? So problem was solved another way. Instead of using converter, I used telerik expression. So this way raw binding is made to expression and filter is working fine. Here's an example. Not the answer you're looking for? Browse other questions tagged c# xaml silverlight telerik radgrid or ask your own question. C#: How to convert a list of objects to a list of a single property of that object?